How many times do you hear America’s public high schools called “Dropout Factories?” How do those words make you feel? The general public hears these words and unfairly accepts that our public high schools and the teachers working in them are failing. Dropout Factories were highlighted in the awful anti-public school propaganda film Waiting for Superman by Davis Guggenheim. The film was backed by Bill Gates. What student wants to set foot in a school called a Dropout Factory? They will run to the nearest charter school called some fabricated B.S. name like Success for YOU! or the Arts and Music (and everything your Dropout Factory doesn’t have) Academy. Poor high schools deserve help, not a negative label. I once taught in a struggling school and it was no picnic. I didn’t realize how difficult it had been until I later worked in a wealthier school. It is also troubling that those who condemn public schools don’t stand up for changing the bad policies or existing conditions—real reasons why students drop out. Instead, sanctions are advocated, or these issues are ignored. Schools lose funds and they are punished, when funding was likely already an issue. Here are possible solutions that are pushed under the radar when it comes to the problem of dropouts. All of them would be especially helpful to students living in poverty. Ending grade retention. In 2002, research by Jimerson, Anderson, and Whipple indicated that retention leads to dropping out. A systematic review of seventeen studies examining dropping out of high school prior to graduation demonstrates that grade retention is one of the most powerful predictors of dropout status. Yet, in states like Florida, student retention, often based on a standardized test score, is hailed as a solution by politicians and school critics. The research is ignored. If this country is serious about keeping students in school, end third grade retention! Lowering class size. The STAR Tennessee study showed that lowering class size in K-3rd grade made a positive difference in student progress. But there have been few, if any, attempts to lower class size in these important grade levels. Why? Studies also show that class size matters at the middle and high school levels. Overcrowded classes and schools are serious issues that should be addressed. If so many are worried about dropouts, why not lower class sizes especially in schools with students at-risk of dropping out? School-based after-school programs and school psychologists. Not only should the President not end after-school programs, according to Davies and Peltz, (2012), it would be a good idea to add school psychologists to the mix. We know that at-risk youth tend to feel better-connected and will feel more inclined to stay in school if they have an after-school program they can attend. School psychologists can help students better work out their difficulties. Increasing counselors. Many elementary, middle, and high schools do not have enough counselors to meet student needs. Providing at-risk students with counseling every step of the way is critical. Why isn’t there greater effort to add school counselors to our schools? Better Special Education. Children with serious behavior problems deserve special assistance. Throwing them into a general classroom for the sake of inclusion will not address their problems adequately. Schools need a continuum of educational and behavioral services for students. And parents must have available options within their schools. Teachers also need to be specially trained. So why are special education services being eliminated? School nurses. School nurses keep students in school. Read about why one school nurse for 4,000 students isn’t going to work. If children are not well, they can’t concentrate. We know the importance of school nurses, yet how many schools have qualified nurses? How many schools at all levels still function without any nurse? Robert Balfanz, is the Johns Hopkins researcher who coined the term Dropout Factory. He holds a B.A. in history from Johns Hopkins University and a PhD in education from the University of Chicago. He has written and spoken much about the dropout problem. other noteworthy suggestions that good schools might consider. We acknowledge that some people may view the term “Dropout Factory” has [sic] a harsh and unfair term. We use it to describe a harsh and unfair situation, under-resourced and over-challenged high schools which educate primarily low income and minority students and year after year are unableto graduate the majority or near majority of students who enter the school. We recognize that these schools are filled with hard working and dedicated teachers and administrators and resilient students. Our goal is to shine a spotlight on what has been called a “Silent Epidemic” the low graduation rates of the nation’s low income and minority students and to demonstrate that the dropout crisis is concentrated in a relatively small sub-set of schools. This potentially makes solutions more possible as resources and supports can be targeted to where they are most needed. Balfanz’s credentials are impressive. But while I think he has done some good work when it comes to understanding the dropout problem. I also believe he is tied to corporate school reform. He received an Investing in Innovation (I3) validation grant. A year ago Education Week reported that these innovation grants, established through the American Recovery and Reinvestment Act of 2009 (ARRA), went to school districts but also to reform groups like Teach for America and KIPP. Then there are the Alliance For Excellent Education and the National Forum to Accelerate Middle Grade Reform awards. These are both Bill & Melinda Gates backed programs. Last, Robert Balfanz is a Middle School Matters Fellow at the George W. Bush Institute. In addition, Johns Hopkins University’s School of Education has been involved in data-driven school reform initiatives, and they highlight Teach for America. Several of their programs are connected to school reform groups that would like to privatize public schools. It is important to try to understand why students drop out of school. But you can’t pick and choose possible reasons, and call them evidence-based, without paying attention and demanding change when it comes to all the existing factors. And evidence won’t work if real reasons for dropping out are ignored. We need to quit calling our high schools Dropout Factories. And we need to fund all the solutions we know will have an positive impact on at-risk students and their schools. Jimerson, Shane R. 2002. Gabrielle E. Anderson, and Angela D, Whipple. “Winning the Battle and Losing the War: Examining the Relationship Between Grade Retention and Dropping Out of High School.” Psychology in the Schools. 39 (4): 441-457. Mosteller, Frederick. “The Tennessee Study of Class Size in the Early Grades.” The Future of Children. Summer/Fall 1995. p. 113-127. “The Importance of Class Size in the Middle and Upper Grades.” www.classsizematters.org. Davies, Susan C. and Lindsay J. Peltz. 2012. “At-Risk Students in After-School Programs: Outcomes and Recommendations.” Principal Leadership. October 2012. 12-16. Camera, Lauren. “Many School Districts Don’t Have Enough Nurses.” U.S. News & World Report. March 23, 2016. Here’s another way to think about the whole “failing schools” lie promoted by those who see public education as the latest pot of gold for a corporate takeover. Thank you, Judith! Yes. The failure “is in the policy” or not addressing what we know works “not the children!” Love this! I did not know this! How awful! Thanks for sharing. I love to hear your experiences Ciedie. And thanks for sharing this post. I worked in a school that was labeled a drop out factory by the Indianapolis Star, and it was an accurate description. Without adequate support for struggling students in terms of social workers, behavioral therapists, tutors etc, students who struggled were actually “pushed out.” I had taught in elementary school and one of my elementary kids was 18 and just a junior, he had finally turning around his academic life and they put him out, an assistant principal walked into his class, took him and he was never seen again. When they received this label they started to “massage” the numbers to alter the facts….they didn’t do anything to keep kids from failure. I did some research across several years and discovered within the group of kids I followed anyone who was older that 15 years and 9 months when they entered high school did not graduate. I looked at a number of factors, and this was the one with the strongest correlation between a factor and graduation, so I asked the person in our district to check the dates of birth for all our grads, across about 8 big high schools, and with the exception of students from our Adult program, it proved true across the district…..I suggested some ideas we could implement to create cohort groups and an accelerated program for our 15+9 freshmen….but no one was interested. The focus was always what was in the best interest of the school, not the best interest of the students. De-funding public schools to privatize hurts kids. There’s no question about it. Thanks for your comment, Saundra! 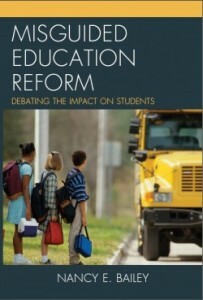 I read of this on Diane Ravitch’s site. You make excellent points. I would be interested in what sort of alternative programs you would suggest to battle students moving up the ladder without the proper skills in place. Retention is certainly not the answer, which has been demonstrated, but neither is graduation quotas, the NCLB atrocity that has meant that many of our graduates are barely deserving of the sheepskin. All the solutions I have are very expensive. Ideas? Great question, Roy! I must thank Diane Ravitch. I do think smaller class sizes especially in K-3rd are important. There are different set-ups if schools would only get creative. Instead of focusing so much on data collection and assessment, the focus should be more on solutions for students! Multi-age grouping might help a child make progress without the humiliation of retention. Looping, where children get the same teacher 2 years in a row would give the teacher more time to understand where students are coming from. And it would give children more time to pick up skills. I think Robert Balfanz and others have some good ideas about keeping students in school too, like those listed above. I just take issue with the term he came up with. We should also not ignore the benefits of a resource class where students get additional 1-2 hours a day for help with deficient skills in reading or behavior. For preteens and teens I think it’s all about engaging them in their interests and getting them involved in school and in after-school programs at the school. 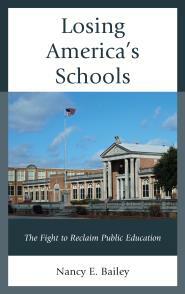 Public schools have been terribly defunded for years. Think how much money is wasted creating two systems. Also, it’s too bad so much time has to be spent defending our public schools instead of working together to find adequate solutions for the problems found in them. Thanks! Thanks for the response. I Think the key is smaller class size for children who are having difficulty, but even this cannot cure the malady of property that is a result of chaos. Some families have poverty thrust upon them, and others create poverty with chaotic habits. These are the situations that seem intractable to the teacher. I know this sounds like heresy, but until educators (and parents) recognize that one-size-fits-all standardized education is educational malpractice, very little will change. The current system ignores developmental readiness, and rewards only those learners who are strong in verbal and mathematical intelligence, while implying that children strong in other intelligences are failures. It totally ignores the normal variability of human beings, and implies that there is only one path to “success” (climbing up the ladder). Mixed-age learning is much more important than lessening the humiliation of failure. It is consistent with the way children authentically learn from older and younger learners, as well as in the perfectly normal differences in developmental readiness, which often differs from context to context. Learner-centered education isn’t about money–it’s about a change in the beliefs of teachers about the purpose of education and their role in the learning process. Why do many children dislike school when they LOVED learning before they were forced to sit in a desk and listen to a teacher? Hint: It’s NOT because they are lazy or lack “grit”. Everyone is trying to figure out how to make learners fit the structure of school, rather than adapting the school to the needs and interests of students. Children are motivated to learn when they see a purpose in it…and despite what many believe, seeing that purpose requires input by the students–self-direction–choice. I wish that every public school educator could spend time in a true learner-centered school and see the difference in the children. Their love of learning is a pretty powerful argument for the effectiveness of this approach. I agree with the premise that the one size fits all approach is a big problem, especially if the one size is as it is now, everybody goes to college. By the time sttudents are in high school, their abilities and attitudes have produced wild discrepancies in their performance. One student has spent most of his reading life reading about the crusades and another has been helpin uncle Ed fix cars. We need to honor both experiences. And more, of course. Thank you for the questions you raised, Roy. Judith, I agree. Excellent points! Thank you! The section on better special education resonated with me since the trend continues to be ways to defund it. Ignoring the damage of RtI to the timely identification of students who need services, we are now faced with redefining learning disabilities as learning differences, so we can rely on universal design as a tool to differentiate instruction for everyone, or nearly everyone, in one classroom. In additon, more recently, competency based learning is being pushed as a new and innovative way to allow for “personalization” of learning. There is only one question one needs to ask to determine whether “personalized learning” is actually personalized. Who make the majority of decisions about what is learned and how it is learned? If it’s adults–it’s not personalized. If it’s the students, it is! Personalized learning was stolen from special education. IEPs are personalized, but the new PL is digital. There’s real concern that RtI was meant to end special education services. Thank you for bringing this up, Cynthia.